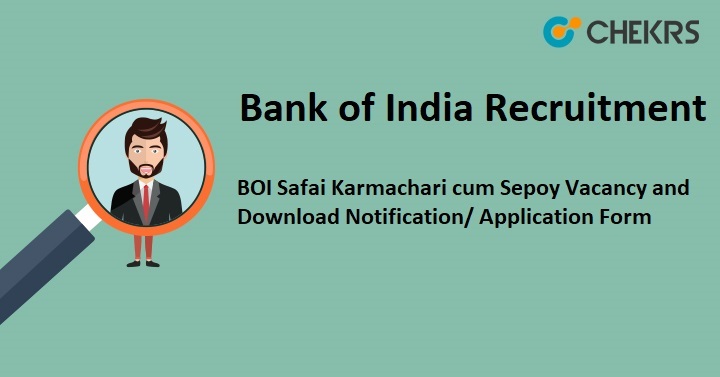 BOI Recruitment 2018: The Bank of India (BOI) has released recruitment notification for Safai Karmachari Vacancies. It’s a great opportunity for the Candidates who are searching vacancies in the Banking Sector. The Bank of India has filled up 99 vacancies in the BOI, Mumbai South Zone, Mumbai North Zone and Navi Mumbai Zone through BOI Recruitment 2018. The Application Form Process will complete until 29th august 2018 and its process will be completed in an offline mode. So, you can apply for a Bank of India Safai Karmachari Vacancy 2018. Here, we are providing information regarding BOI Vacancy 2018 like Application date, Eligibility Criteria, a way of applying for an application form, official website link etc. Firstly the candidate go to the official website bankofindia.co.in. Click “Career” button and a new window will be open. Search Notification of “Karmachari Vacancies” and click this link. Before application process, the candidate must read recruitment notification carefully. Search bottom side ”Application Form notification” and click this link. Download Application Form and take a print out. Take a copy of the application form for future use. Application Form can be submitted at postal Address. Remarks: For more information, we can update soon about BOI Recruitment 2018 and we are providing the latest update related to upcoming Recruitment on our website that is www.jobs.chekrs.com. If you have any query about Bank of India Recruitment that you can write comments on commenting box and take a review or feedback.